This is how a crossover is done. Bring in a character from the movie, give them some screen time in a new story, but give them a story that expands the “world” of the movie and the show. This one is driven by what characters would do IN the plot, not by what the plot needs the characters to do. 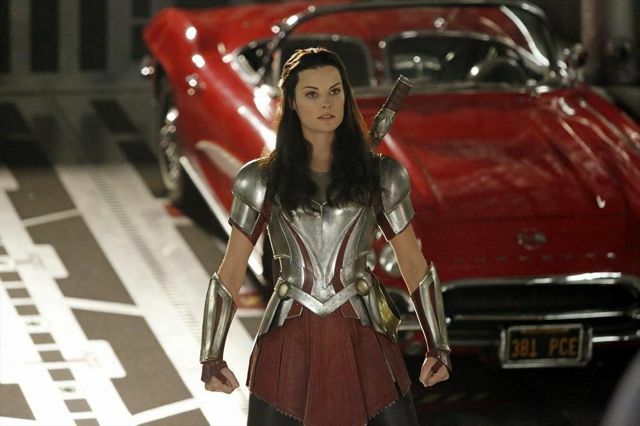 In this episode, Sif came to earth to track down an Asgardian who escaped in Thor: The Dark World. Is that the way it should be done? Yes! In The Well, two Asgardian plots happened to happen in the same episode. Because there was a movie and they needed to do it. The Asgardian material is good enough. Then you have Coulson looking for answers (“You ever come across any blue aliens?”) which actually ties into Guardians of the Galaxy a little bit, naming off some alien races we could se there. And then there is Ward getting brain controlled by Sif. So we have an agent of Hydra pretending to be an Agent of S.H.I.E.L.D. who is being mind controlled to obey the whims of Sif. And we think the betrayal of trust between May and Ward is that he desires Skye. No. The real betrayal is coming. Yes. This is how it should be done. Until Turn, Turn, Turn and Providence. Then that's how it should be done.